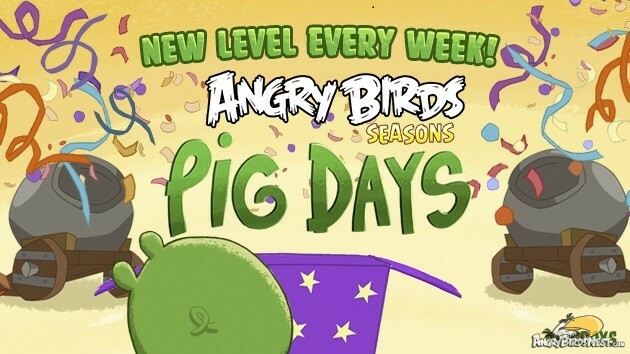 Welcome to the our complete Angry Birds Seasons The Pig Days Walkthrough Guide for quick access to all Pig Days levels. Pig Days are themed weekly levels celebrating various special events, anniversaries and holidays from around the world. If you need help with any of the levels our walkthroughs are below. Also, be sure to also enter your scores on our Pig Days leaderboard and compete against the best flingers from around the world. With a bit of sleuthing, we think we have determined the dates of the first few levels! Note that these dates are subject to change and are absolutely not a guarantee. Timing: Levels appear to unlock at approximately 1AM PDT (4AM EDT, 8AM UTC, or go here if you need more times). Jul. 20th, 2014: Commemorates the 45th anniversary of Apollo 11‘s landing on the Moon. Jul. 24th, 2014: Marks the Start of the San Diego International Comic-Con Convention. Jul. 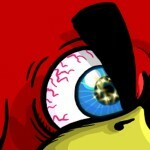 28th, 2014: Commemorates the 4th anniversary of… wait for it… AngryBirdsNest!!! Aug. 9th, 2014: Commemorates the 841st anniversary of the Leaning Tower of Pisa. Aug. 13th, 2014: Celebrates International Lefthanders Day. Aug. 19th, 2014: Celebrates Aviation Day. Aug. 30th, 2014: Celebrates Bacon Day! Sep. 6th, 2014: Celebrates the Basketball Finals! Sep. 9th, 2014: Celebrates the Moon festival! Sep. 12th, 2014: Celebrates the Video Game Day! Sep. 19th, 2014: Celebrates the Talk Like A Pirate Day! Sep. 22nd, 2014: Celebrates the Hobbit Day! Sep. 29th, 2014: Celebrates the International Coffee Day! Oct. 10th, 2014: Celebrates the World Egg Day! Oct. 13th, 2014: Celebrates the Columbus Day! Oct. 15th, 2014: Celebrates the Learn Code Day! Mar. 3rd, 2015: Celebrates the NACA Centenary! Mar. 22nd, 2015: Celebrates Earth Day! May 13th, 2015: Celebrates Leprechaun Day! May 22nd, 2015: Celebrates World Goth Day! May 29th, 2015: Celebrates the End of Middle Ages! Jun. 8th, 2015: Celebrates the World Ocean Day! Jun. 12th, 2015: Celebrates the Magic Day! Jun. 19th, 2015: Celebrates the Midsummer Eve! Jul. 2nd, 2015: Celebrates the UFO Day! Jul. 14th, 2015: Celebrates the Pandemonium Day! July 10th, 2015: Celebrates The Pig Days One year Anniversary! July 30th, 2015: Celebrates the release of Angry Birds 2! October 22nd, 2015: Celebrates Angry Birds Seasons Fifth Anniversary! October 29th, 2015: Celebrates Internet Day! Angry Birds Seasons The Pig Days Level 6-1 Walkthrough | Polar Bear Day! Angry Birds Seasons The Pig Days Level 5-15 Walkthrough | Valentine’s Day 2016! Angry Birds Seasons The Pig Days Level 5-14 Walkthrough | Chinese New Year 2016! Angry Birds Seasons The Pig Days Level 5-13 Walkthrough | Penguin Awareness Day! @sal9 @admins – @steely59 and I determined 3-star thresholds for the next three Pig Days levels: 6-15, 6-16 and 6-17. Where can we post them so that you can use them when you post walkthrough videos for these levels? Where are the golden eggs? I’m playing it on my kindle so there are levels through 14 with additional levels that are staggered up to 50 (I think) with 2 golden egg offers and a mushroom (got it) I can’t find the golden eggs. Any ideas?